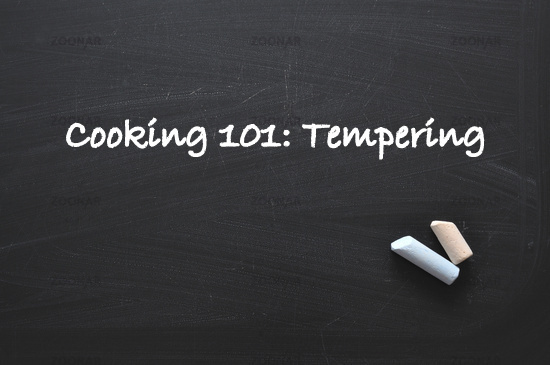 Tempering is an essential part of Indian cooking. It is used in almost all vegetable, rice, meat and lentil dishes in India. Known as 'tadka', 'baghar', 'vaghar', 'fodni', 'chaukna' in various Indian languages, tempering can be used at the beginning of cooking the dish or also as a garnish. Tempering begins by heating a small quantity of vegetable oil in a kadhai (if it is used at the beginning of making a dish) or a small tempering spoon/ vessel (if used as a garnish). Whole spices like mustard seeds and cumin seeds are then added and allowed to crackle, If needed other tempering ingredients like asafoetida powder, curry leaves, dried red chillies, garlic, ginger, etc are added last. Make sure the oil is heated enough. Ideally the mustard and cumin seeds should start crackling about 30 seconds after they're put in. This takes some practice to get right, but don't worry after 5 or 6 tries, you'll get it! When adding the mustard seeds and cumin seeds or whole spices, lower the flame so the hot oil doesn't splatter all over you. Also stand as far away as possible and move back immediately after you add in the spices. 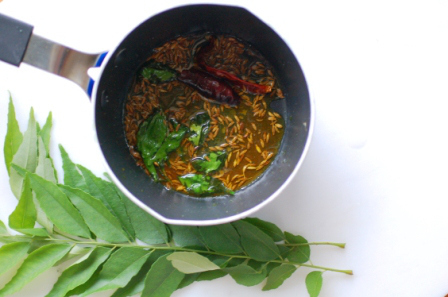 Curry leaves tend to make hot oil splatter even more than seeds. Well, that's simply because after you wash them, the water stays on them. When water is added to hot oil, it's a splatter explosion! Dry the curry leaves a little and it won't splatter as much. And yes, stay as far away as possible. 5 Unique Indian Curries You Shouldn't Miss!